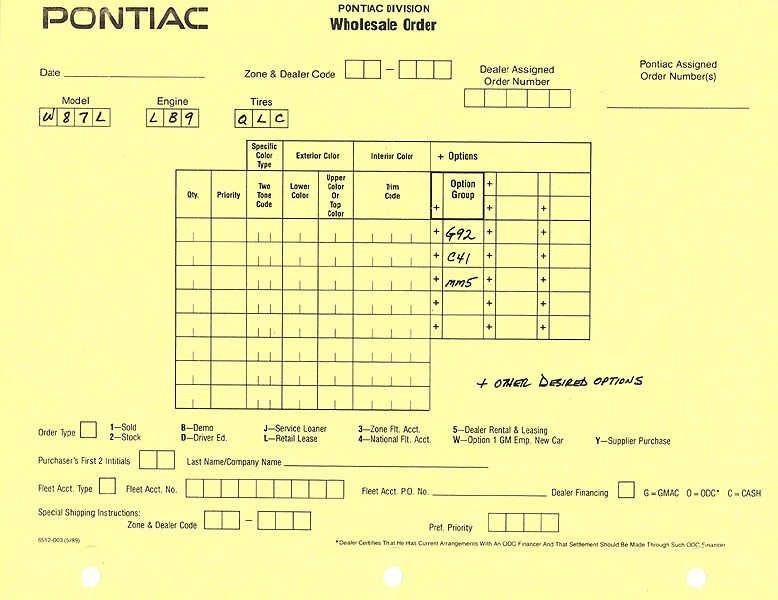 Here at The GTA Source Page, one of the most frequent requests over the past ten years is for documentation.... more, more, more. 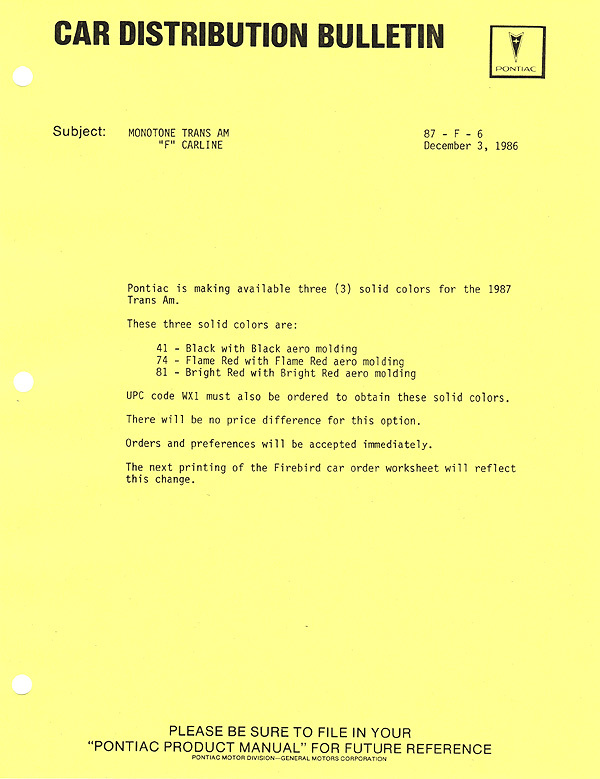 When was this, why was that, what were those for, etc. 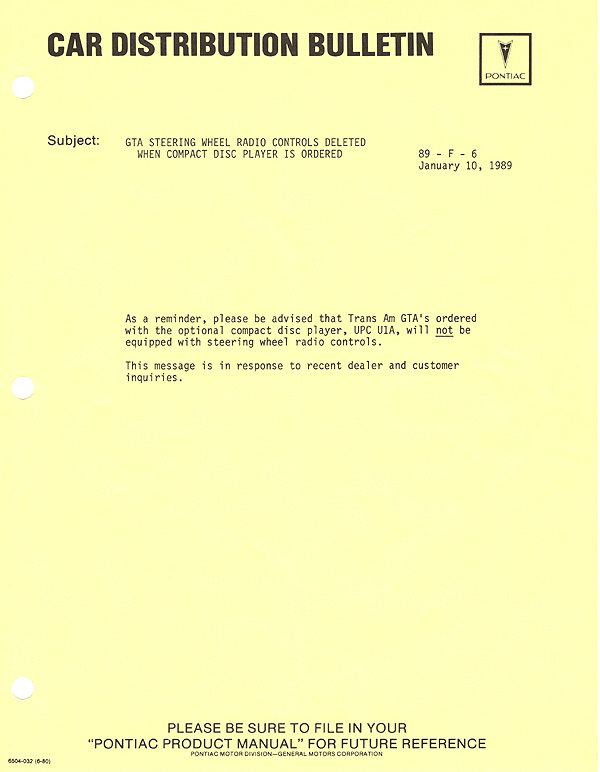 I've found that since our cars were not produced in the electronic age as is the case now, you can't just point and click or use Google to uncover a lot of this stuff like you can a lot of more modern info today. 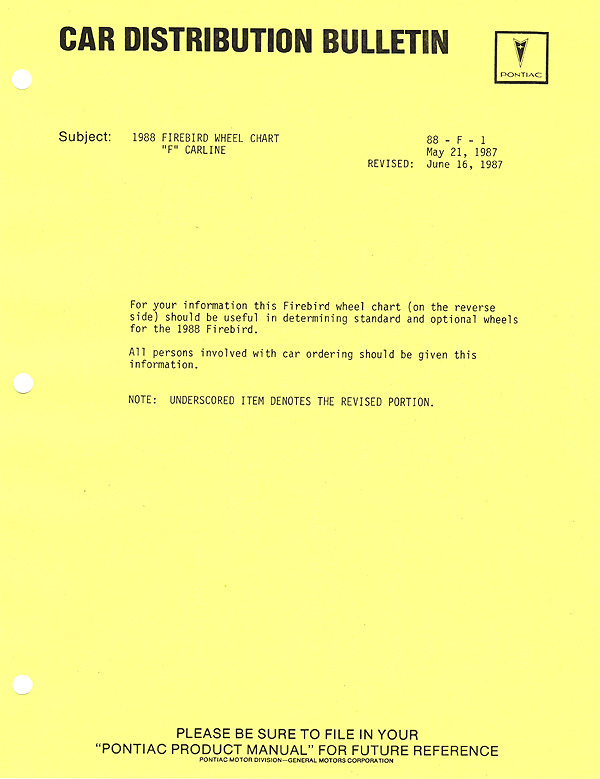 But we definitely do what we can to find out as much as possible. 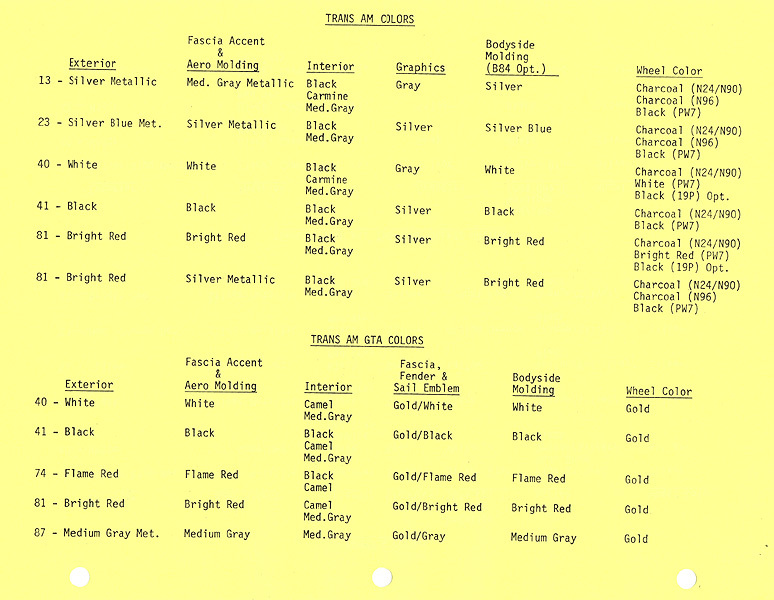 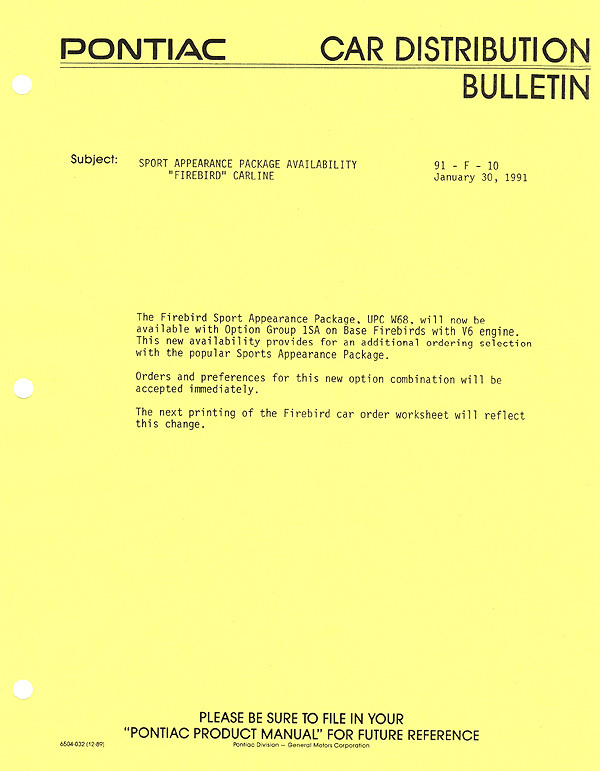 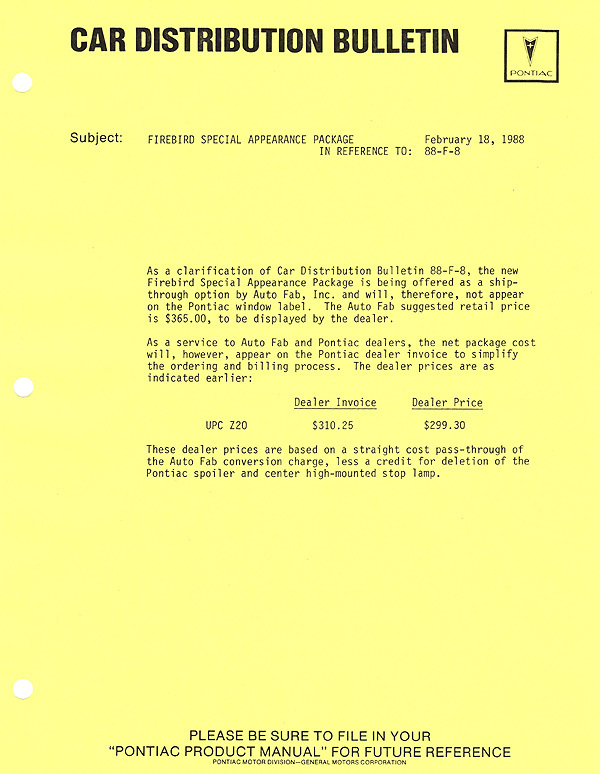 Back in the GTA's day, GM and Pontiac contacted dealers through what were called "bulletins", of both the sales and car distribution variety. 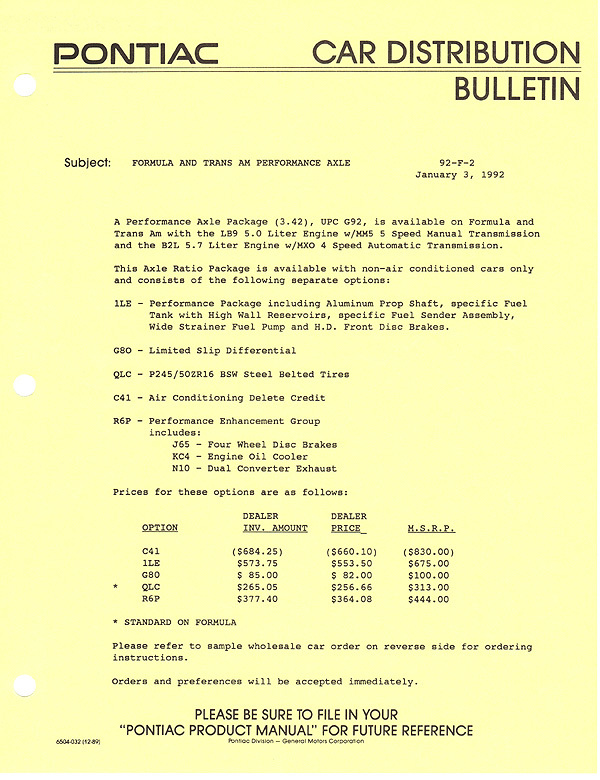 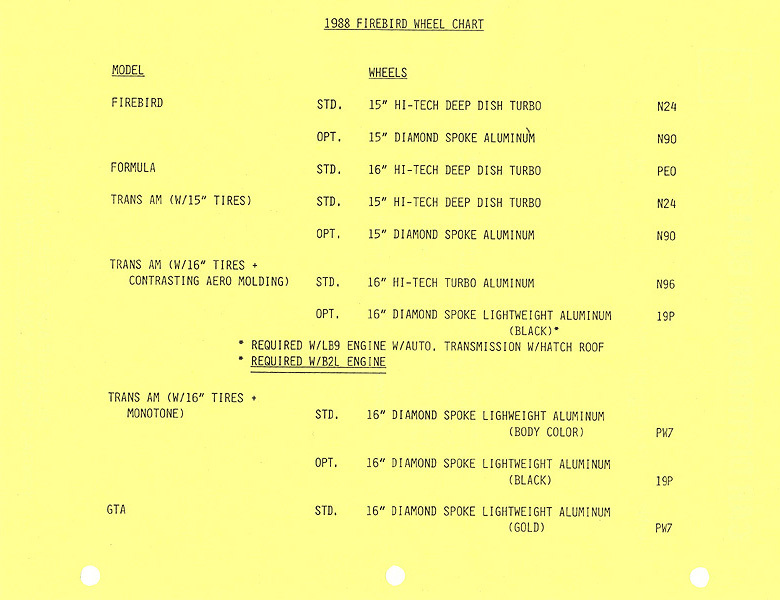 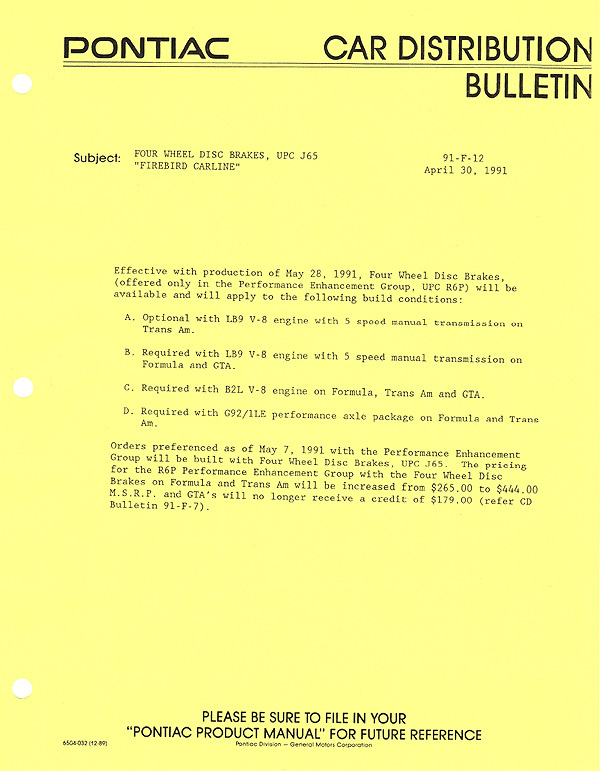 These bulletins were sent to each dealer throughout the model year. 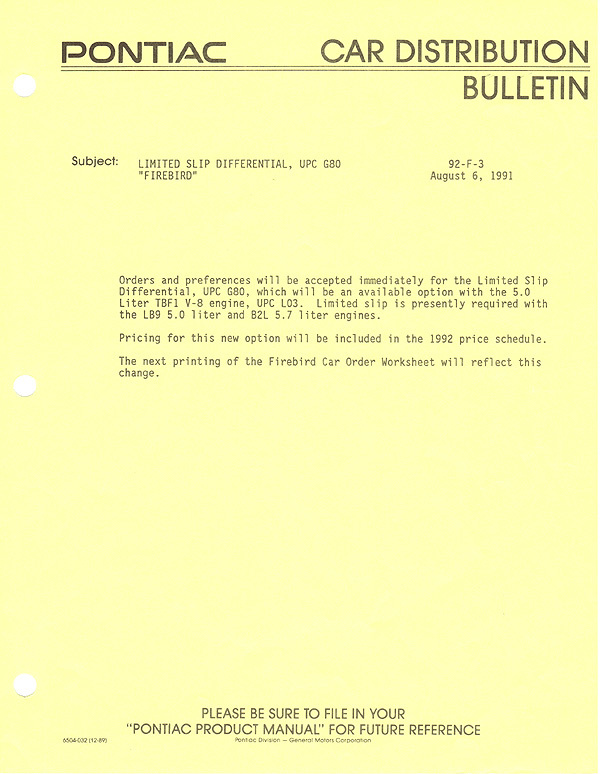 The Sales Information Bulletins (SIBs) were used to highlight certain options that became available during the course of a particular year, whereas the Car Distribution Bulletins (CDBs) were issued to document running production changes at the various factories. 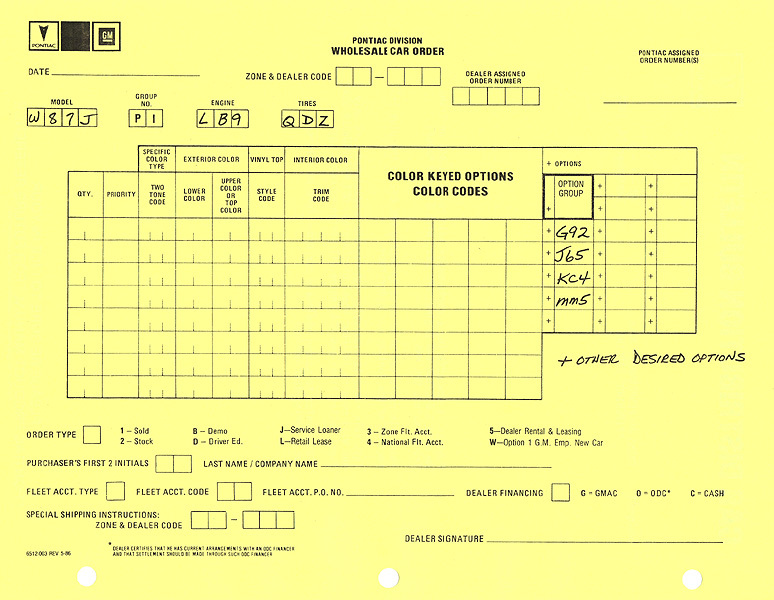 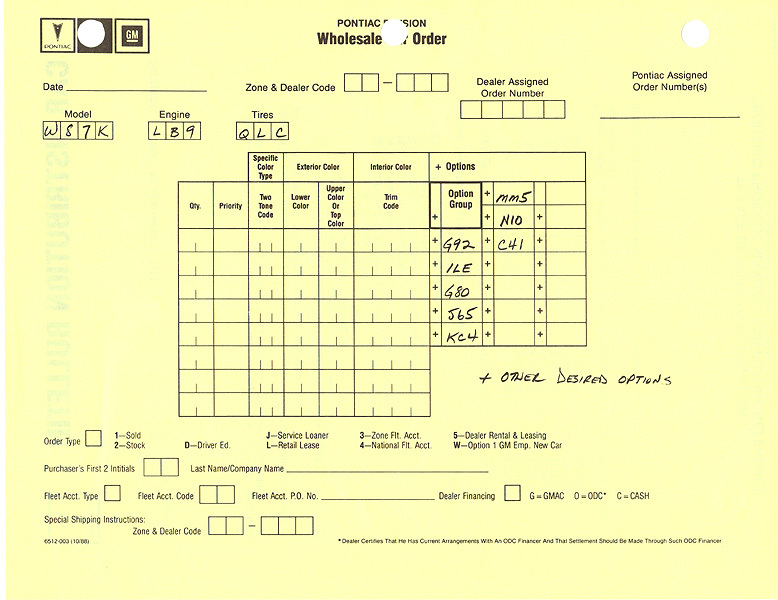 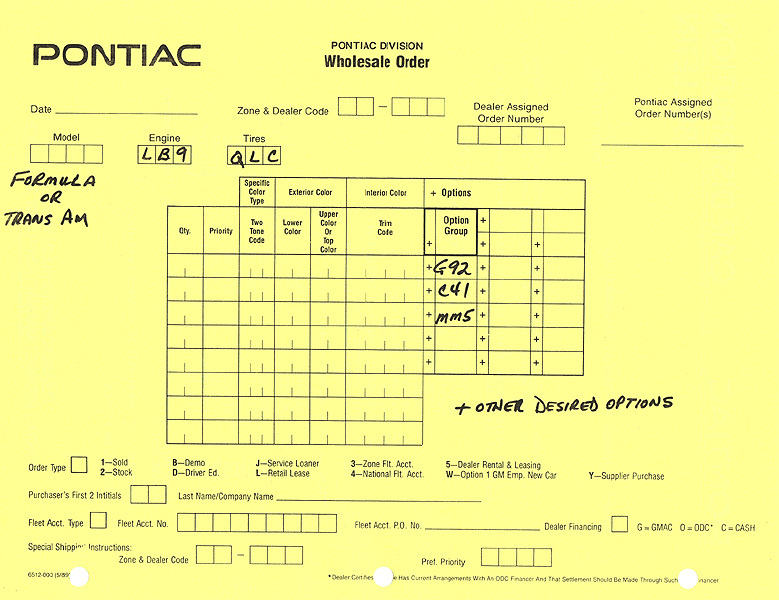 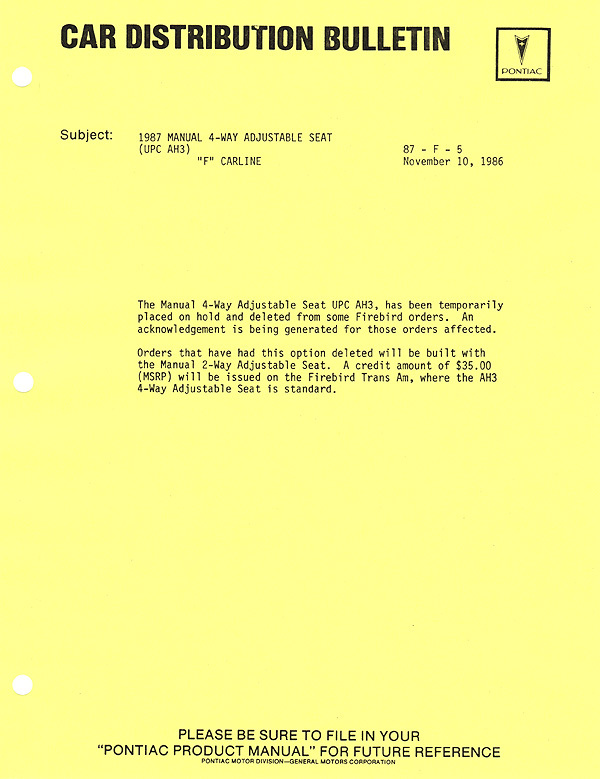 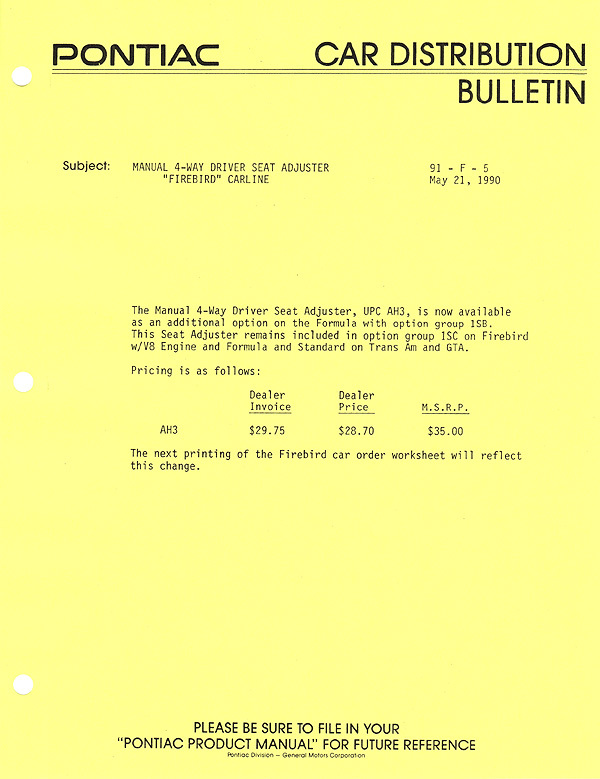 For documentation purposes, the CDBs are usually more informative as they document by date that certain changes, additions, or deletions were applied to the various car lines in production. 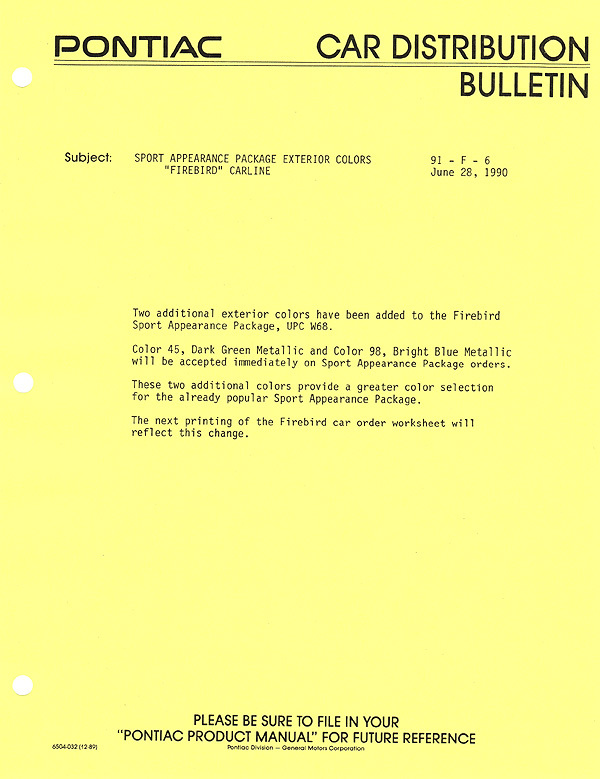 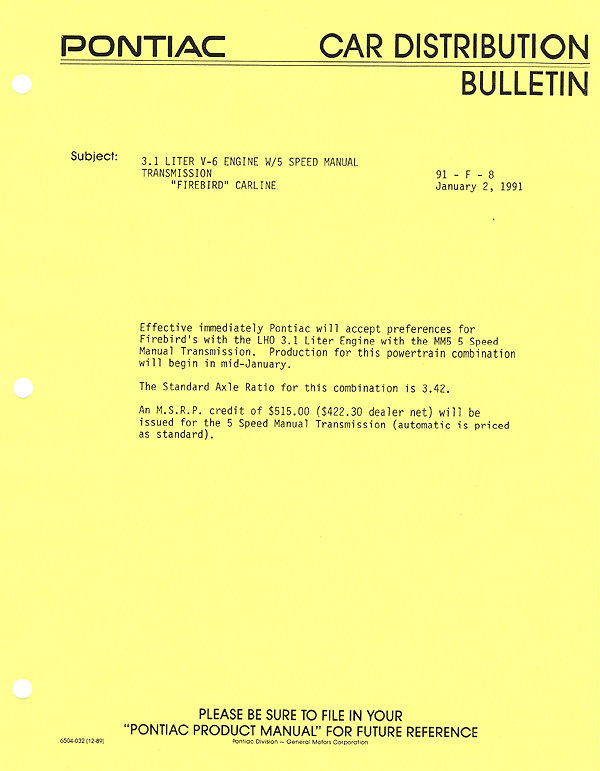 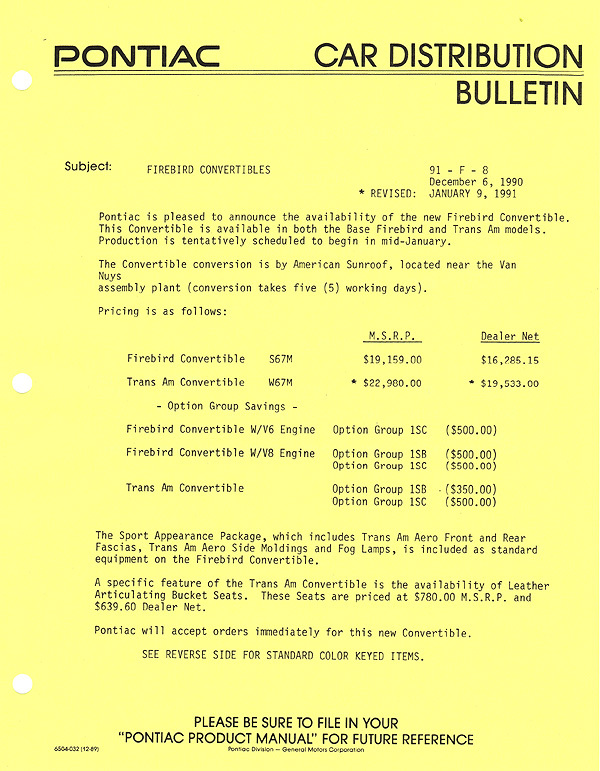 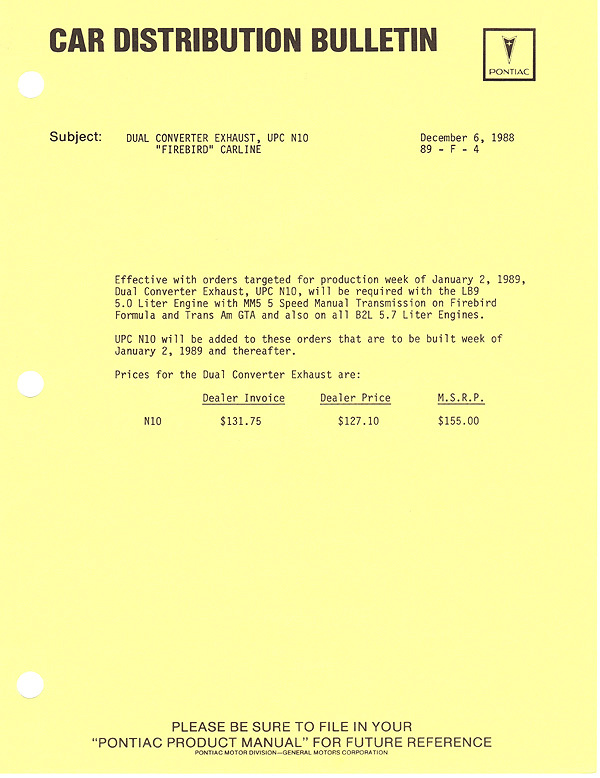 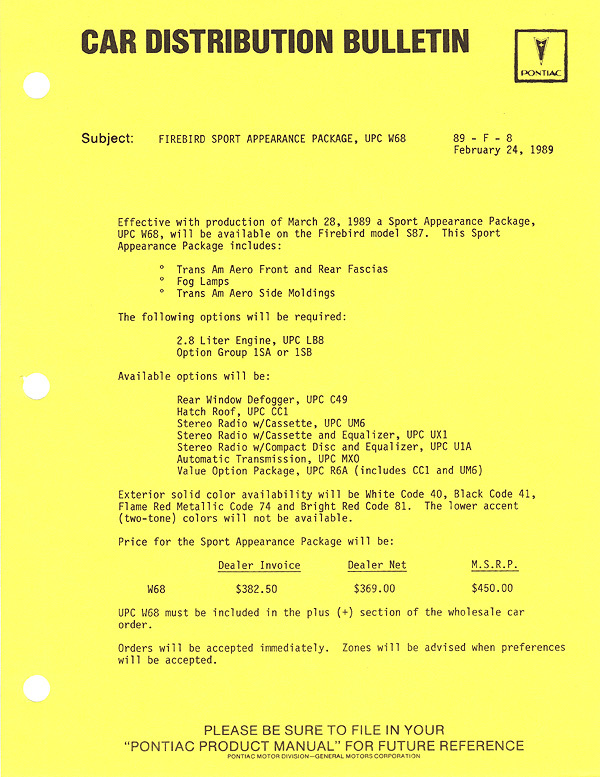 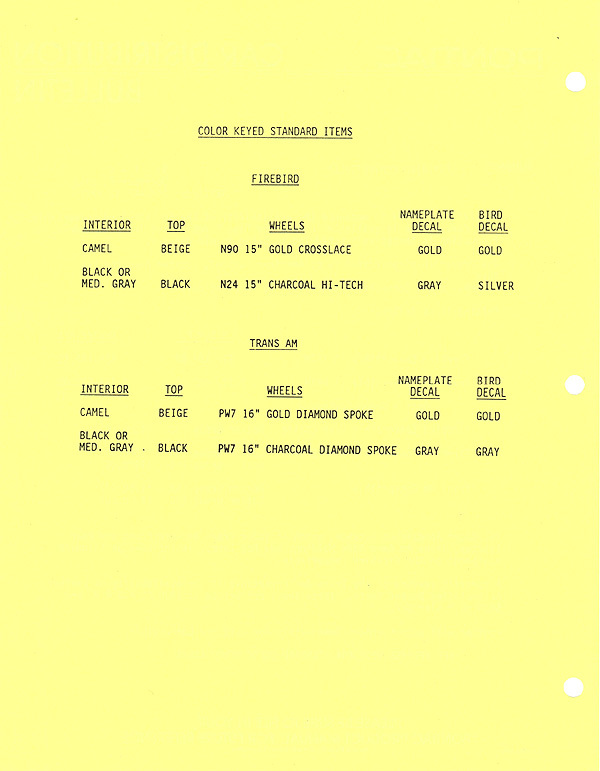 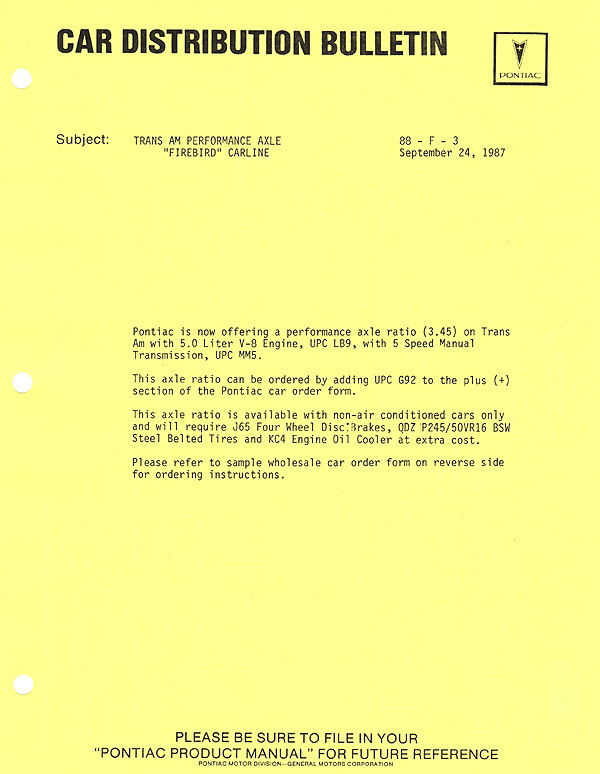 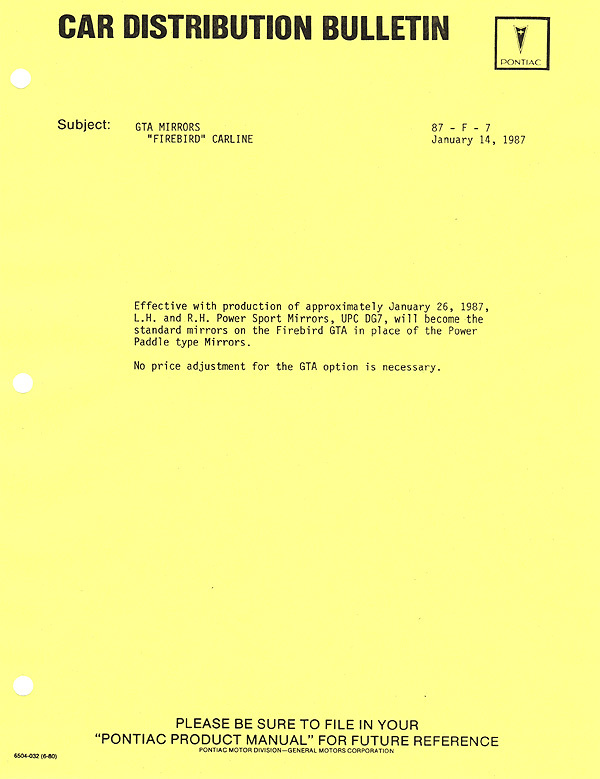 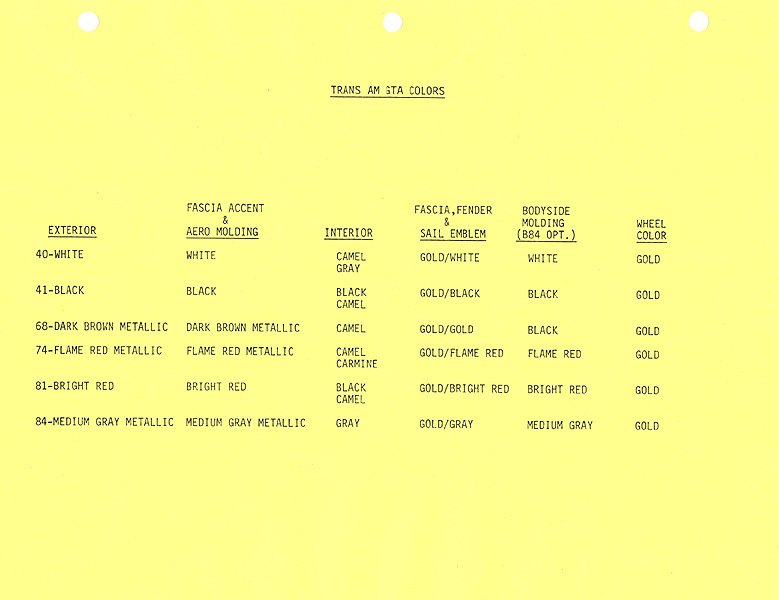 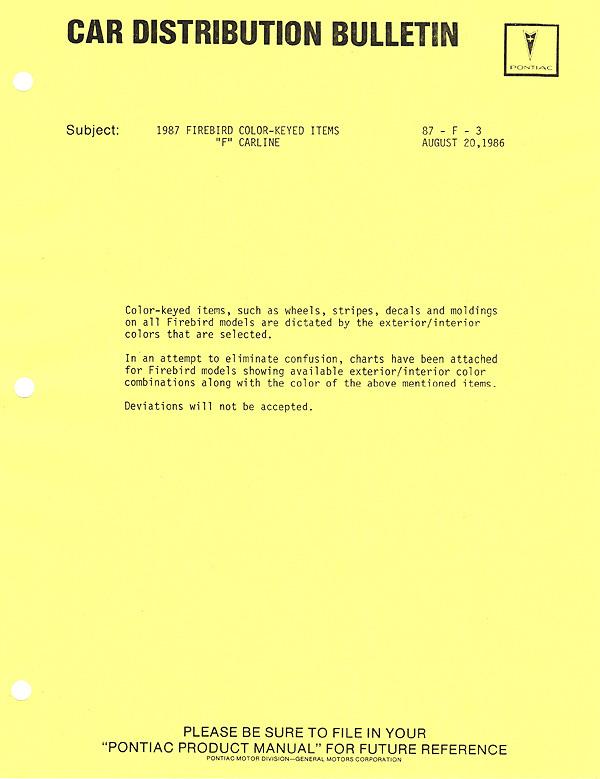 The GTA Source Page has been fortunate enough to obtain these documents for each year of GTA production. 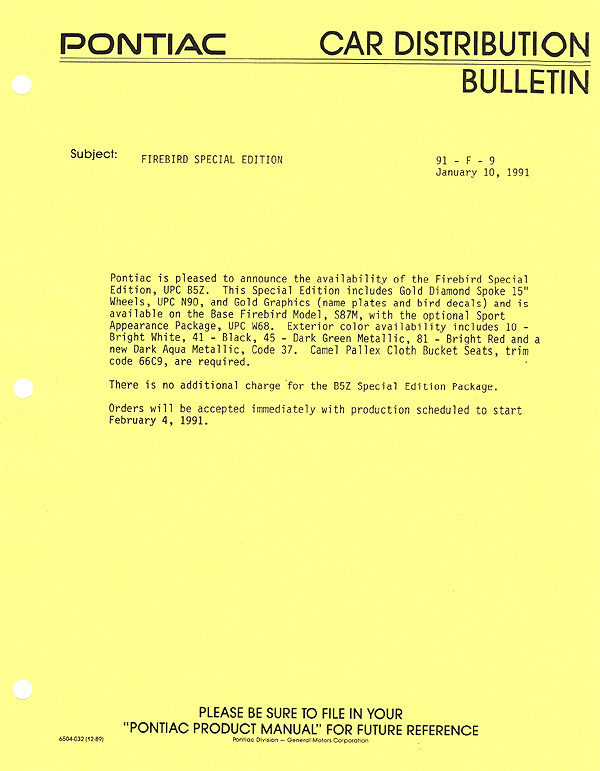 Looking through these documents, I've seen the answers to many questions that have arisen over the years regarding GTA-related production.... there is virtually something documented in each year's CDB collection that addresses something questioned in the past. 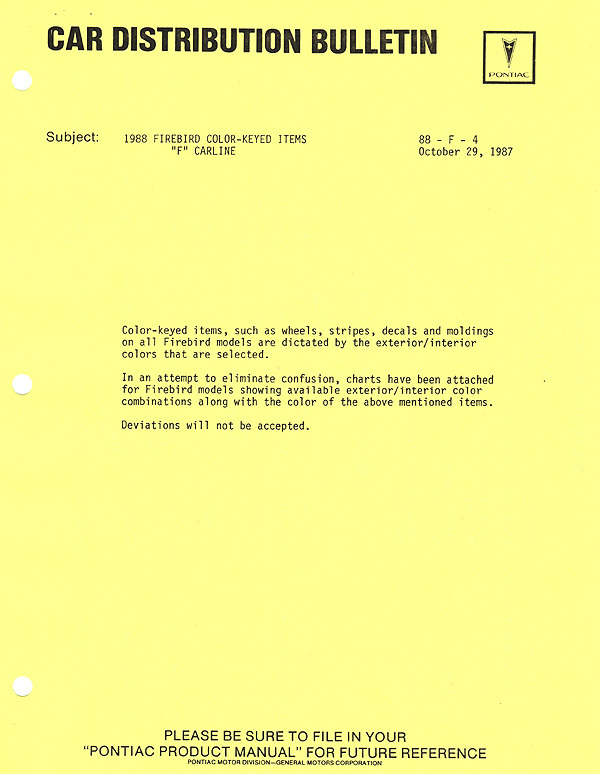 So to have access to these documents really opens up some opportunities to close some chapters on documentation that have been open for many years. 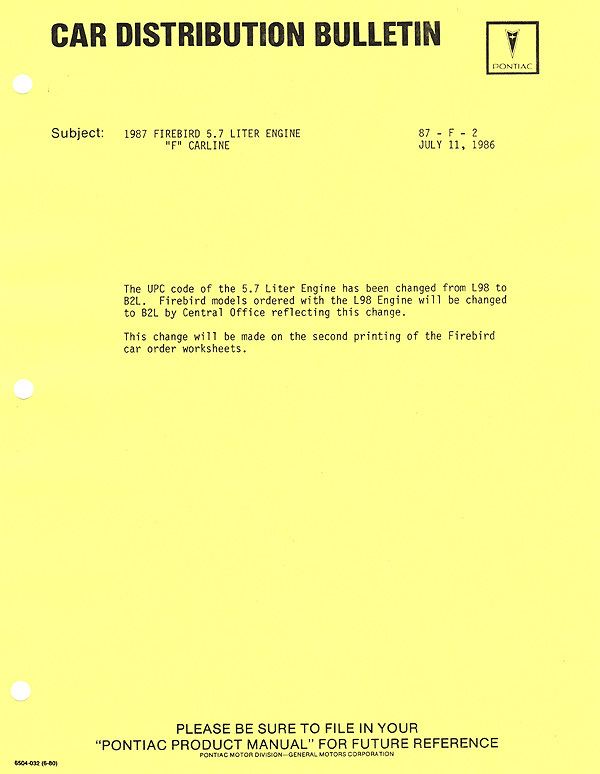 1) CDB 87-F-2 denotes the change of RPO for the 5.7-liter engine from the Corvette code L98 to the F-car code B2L. 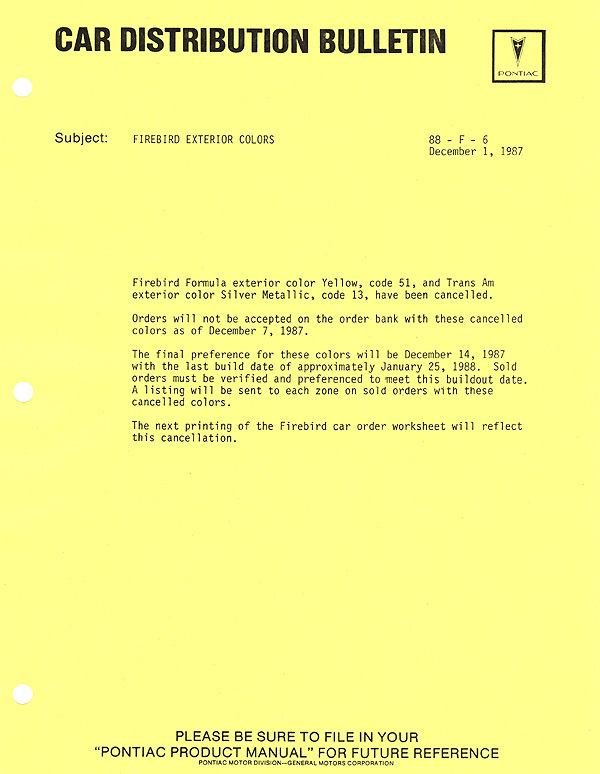 2) CDB 87-F-4 denotes the change of the color code for Gunmetal Metallic from 84 to 87; this color was a GTA exclusive for 1987. 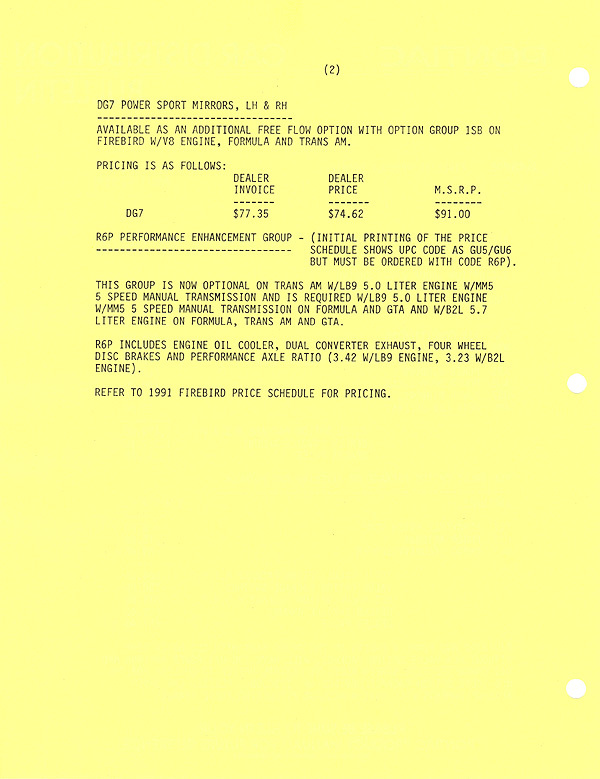 3) CDB 87-F-7 denotes the change in exterior mirror from the DD9 paddle style to the DG7 sport style for GTAs. 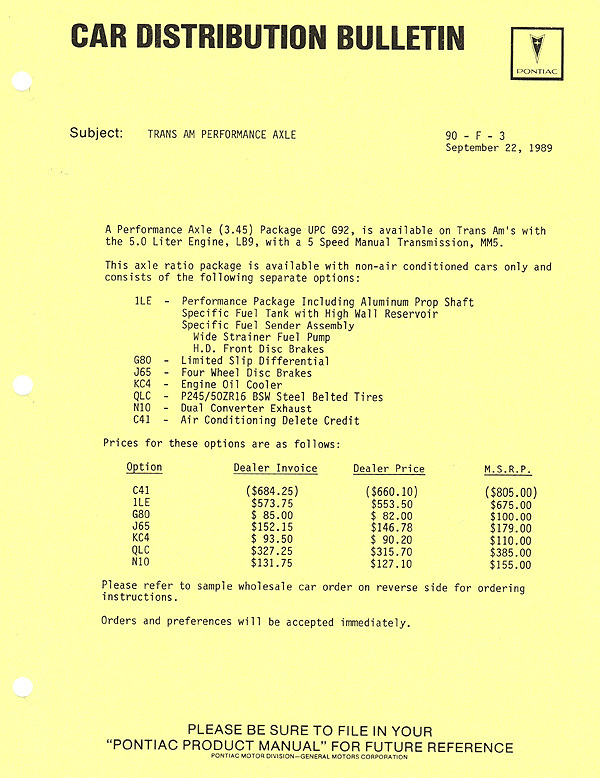 1) CDB 88-F-3 denotes the first appearance of the 1LE package available on Trans Ams.... only three (3) were built for 1988. 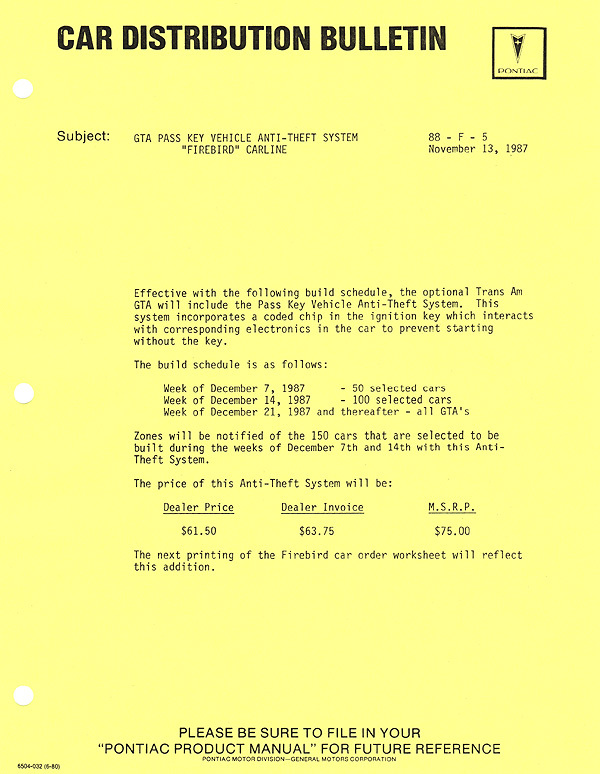 2) CDB 88-F-5 denotes the installation of the PASS-Key theft system on GTAs.... explaining why some earlier 1988 cars have the option and others do not. 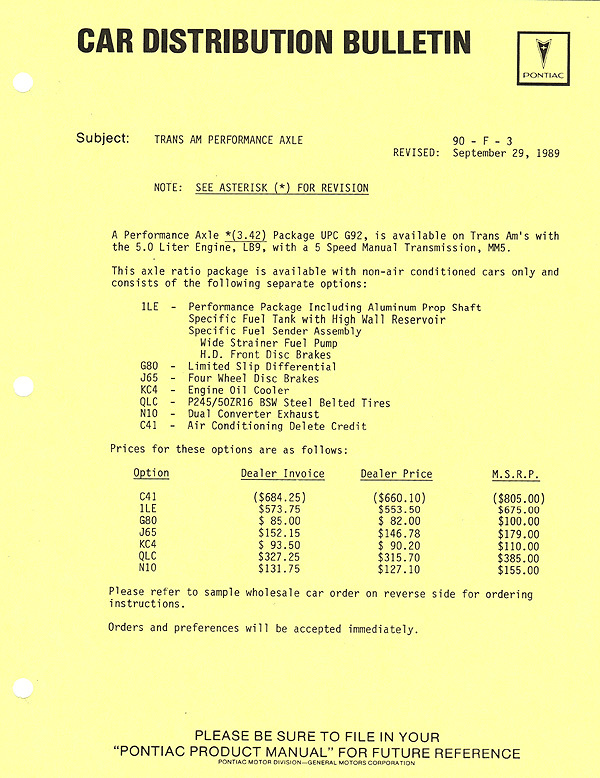 3) CDB 88-F-7 denotes the availability of the GTA Notchback option for immediate production. 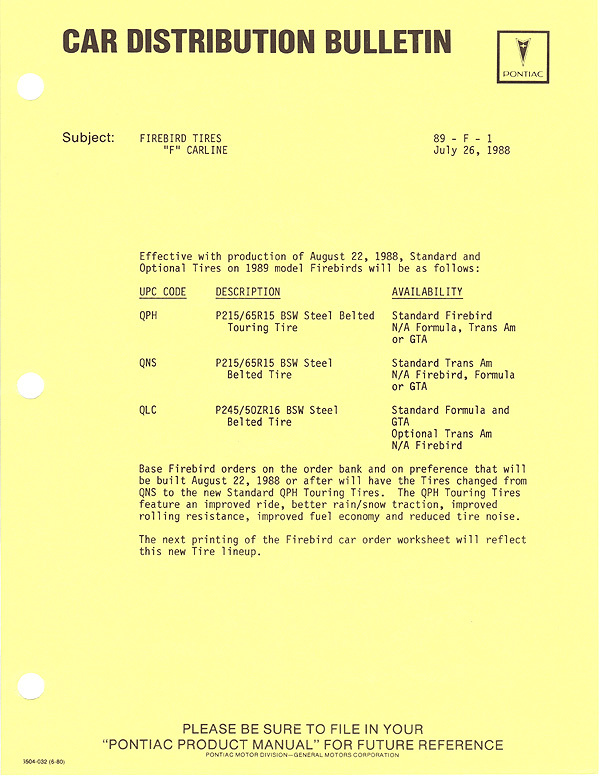 1) CDB 89-F-1 denotes the change to Z-rated performance tires on the GTA. 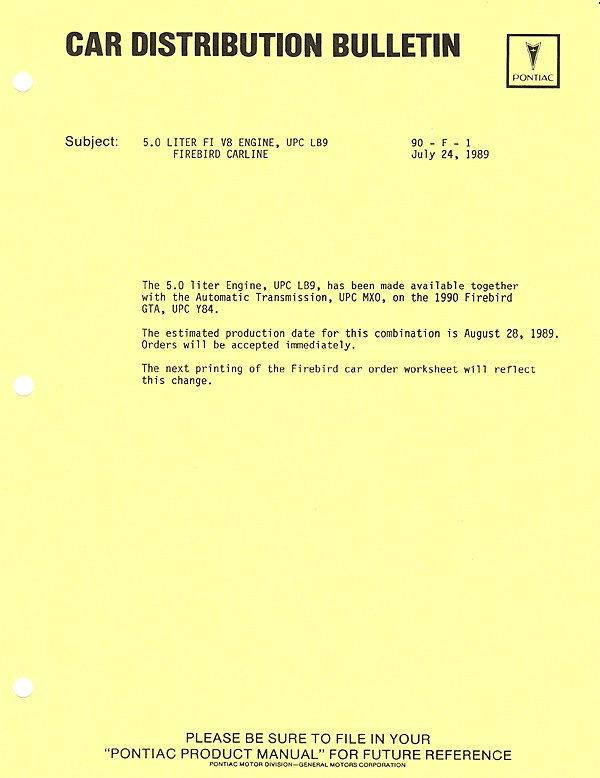 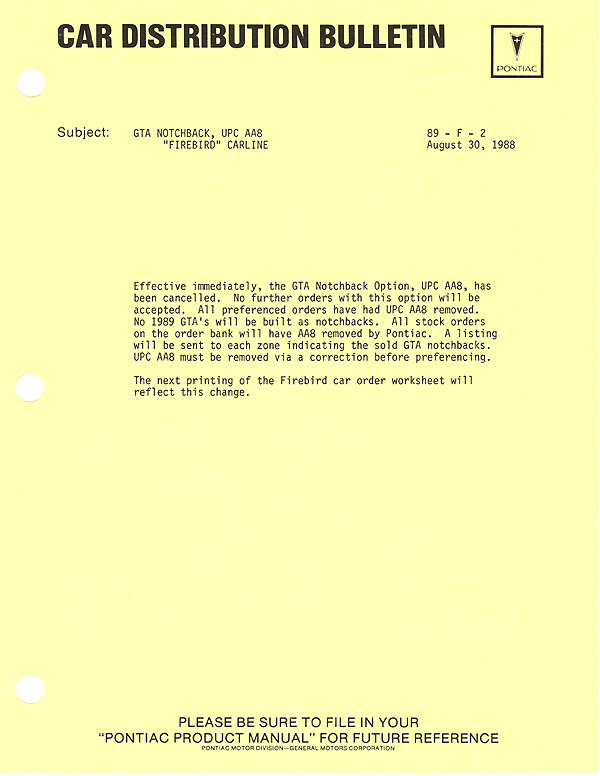 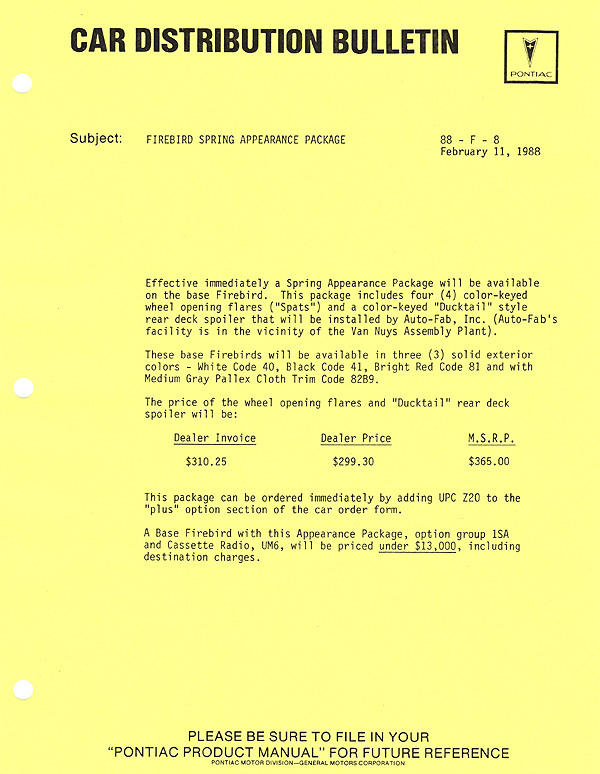 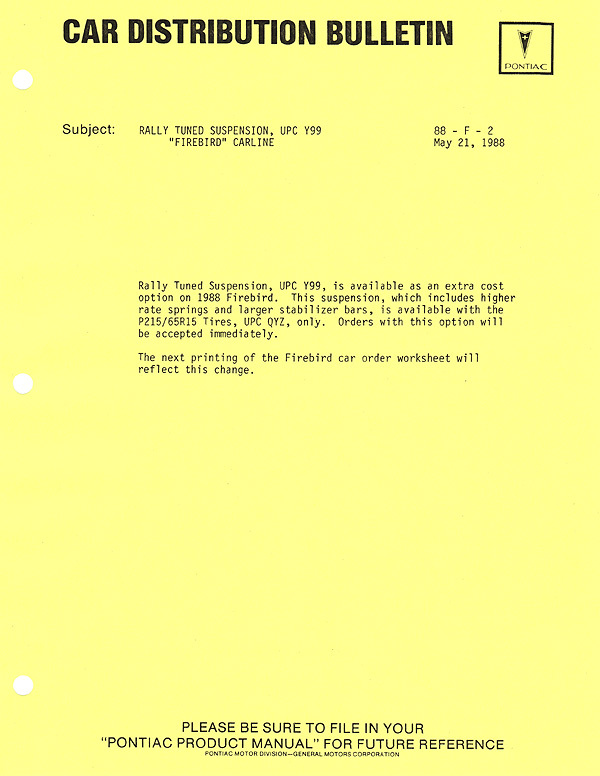 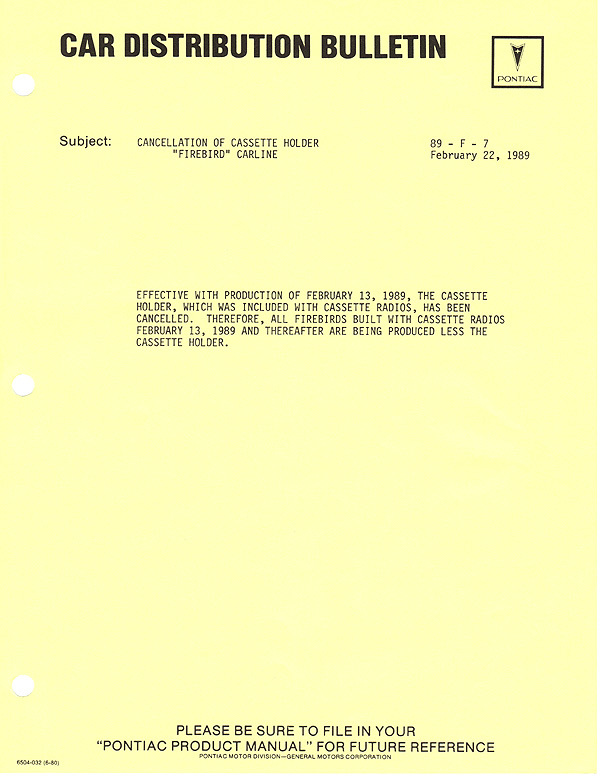 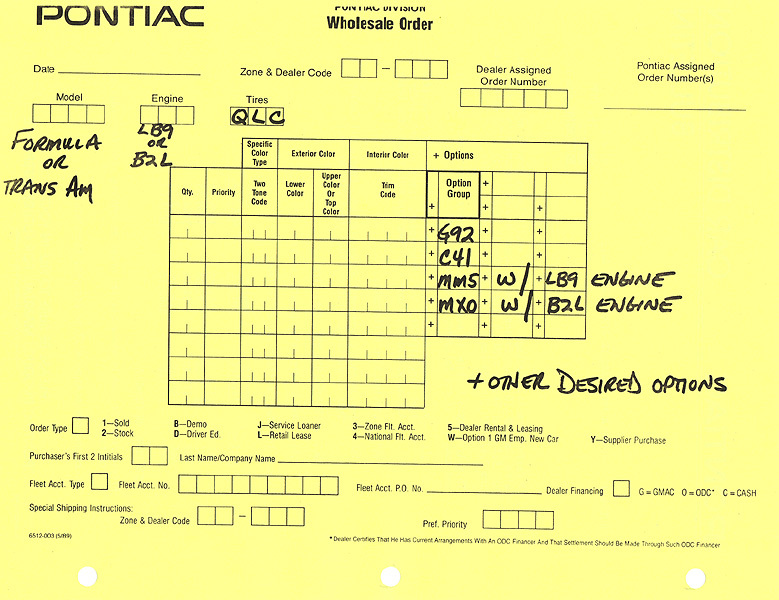 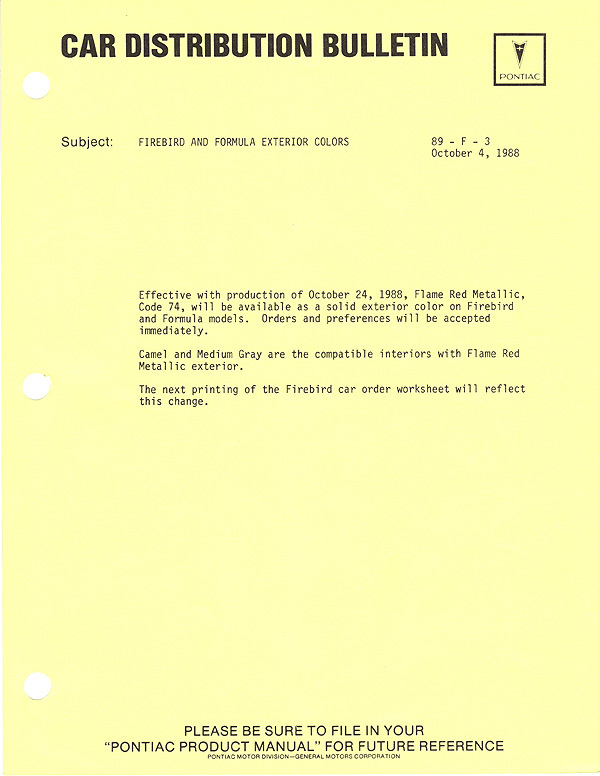 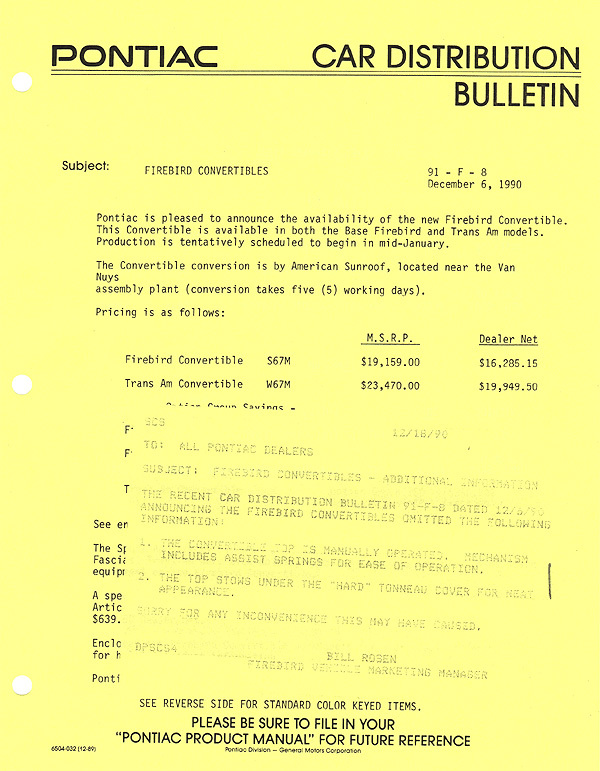 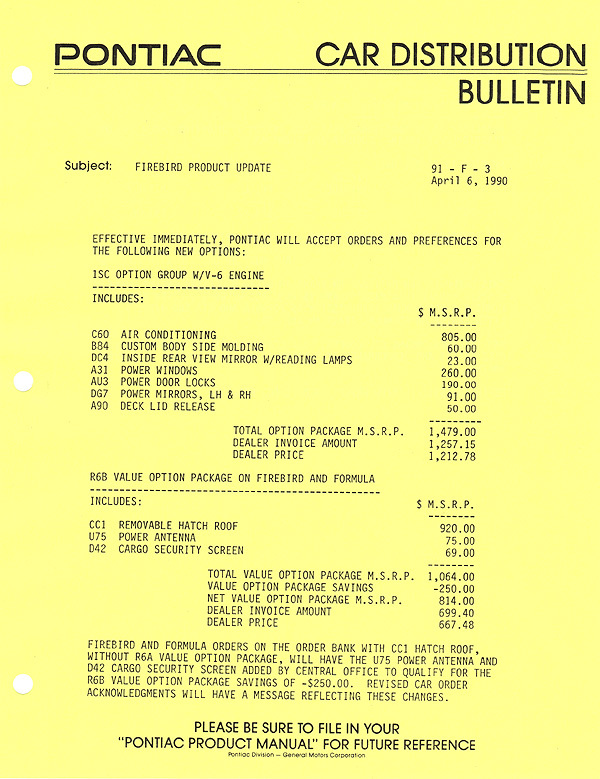 2) CDB 89-F-2 denotes the cancellation of the GTA Notchback option for 1989 production. 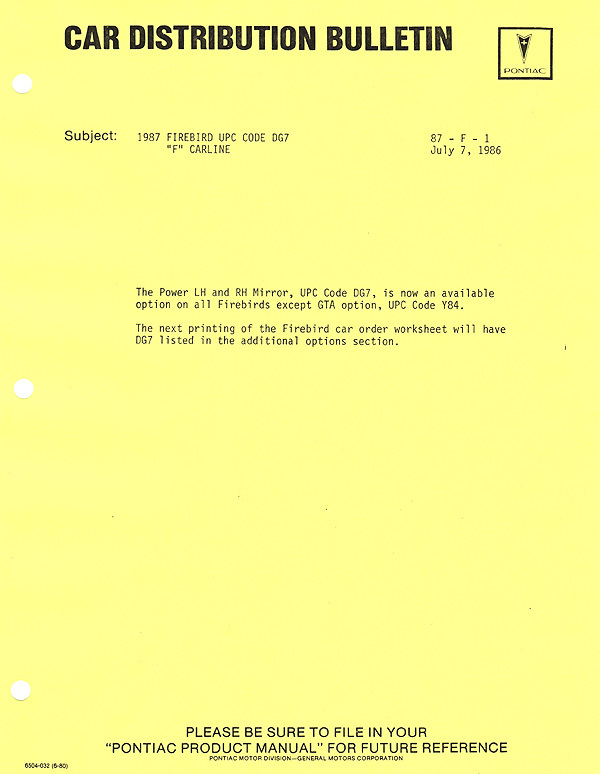 3) CDB 89-F-4 denotes the mandatory addition of the N10 dual-converter exhaust for TPI engines in the GTA. 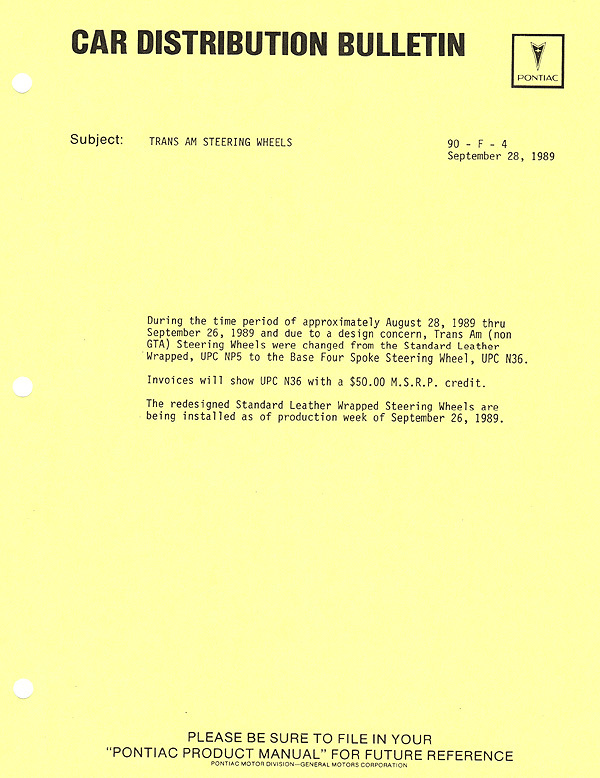 4) CDB 89-F-6 denotes the use of a standard Trans Am steering wheel in GTA models equipped with the optional U1A CD player. 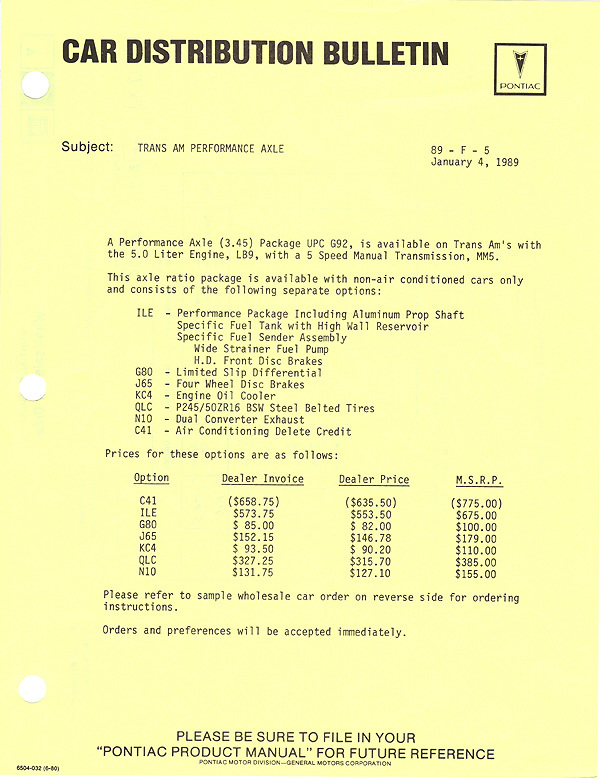 1) CDB 90-F-1 denotes the availability of the 5.0-liter TPI engine with automatic transmission in the GTA. 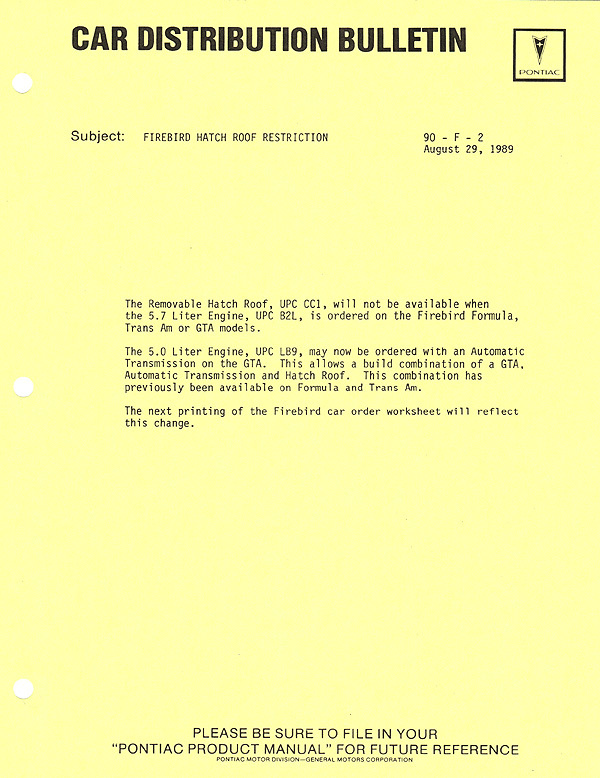 2) CDB 90-F-2 denotes the restriction on specifying the CC1 hatch roof option for Firebirds equipped with the 5.7-liter TPI engine. 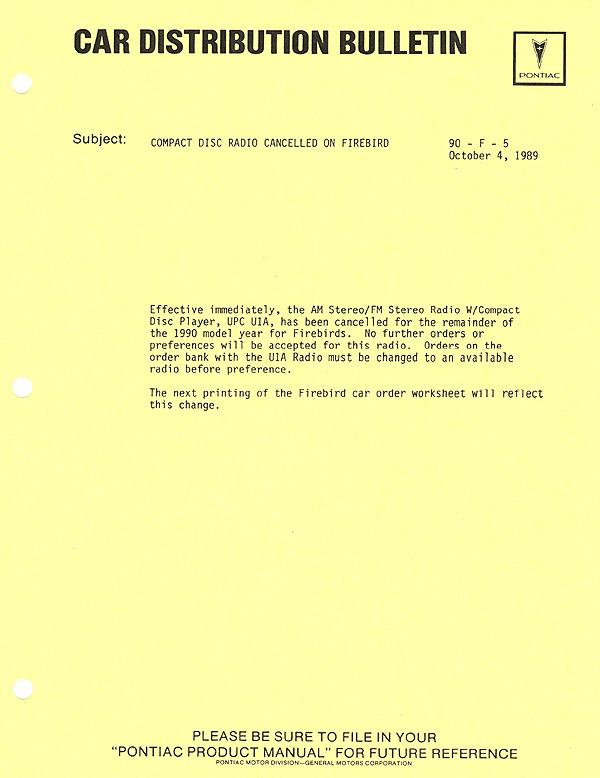 3) CDB 90-F-5 denotes the cancellation of the optional U1A CD player for the duration of the model year. 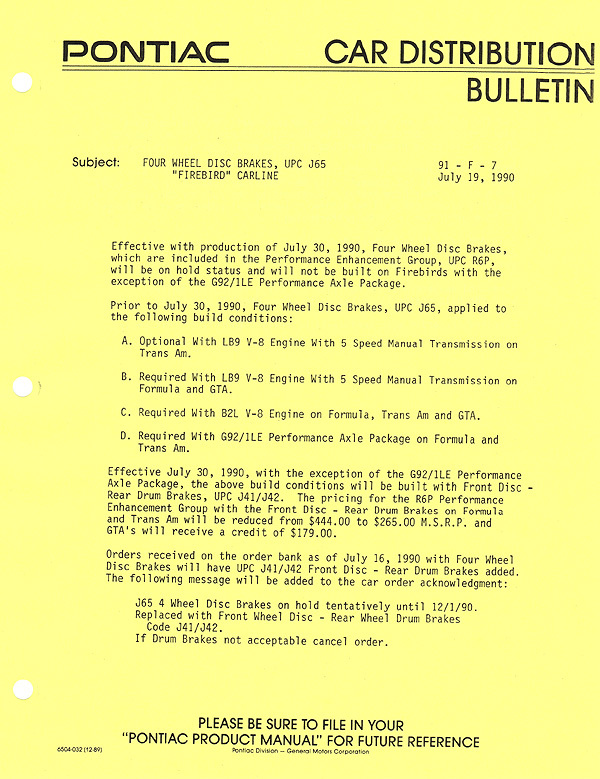 1) CDB 91-F-2 denotes the availability of the B2L engine with the 1LE package on Trans Ams. 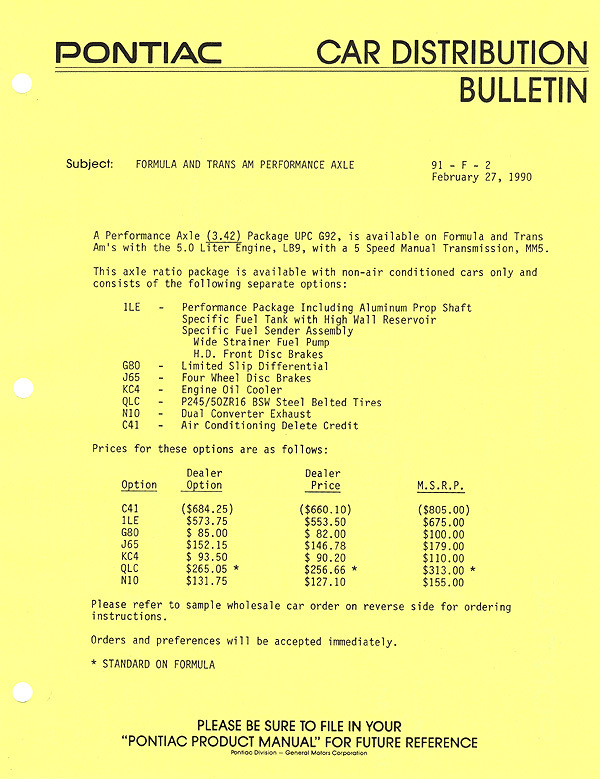 2) CDB 91-F-3 denotes the requirement of the R6P option group on 5.0-liter/MM5 and 5.7-liter TPI engines in the GTA. 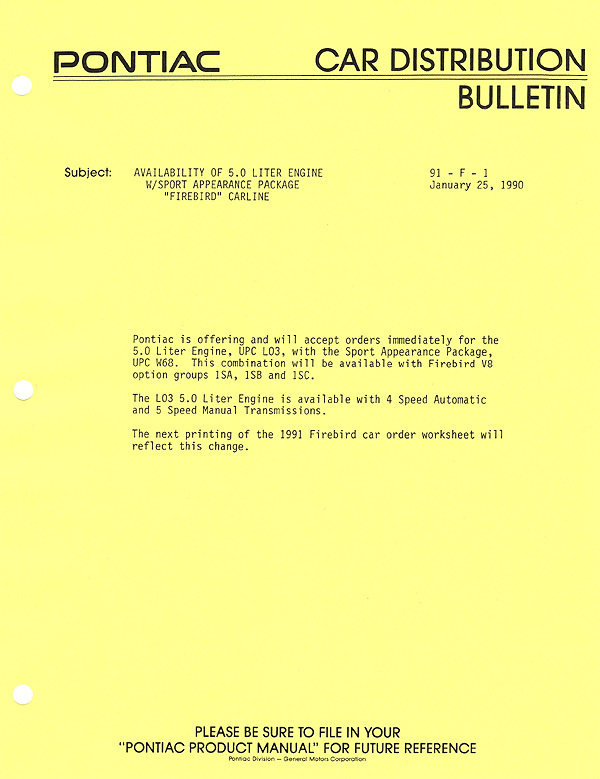 3) CDB 91-F-7 denotes the hold placed on J65 four-wheel-disc brake installations after 07-30-1990, except for 1LE F-cars. 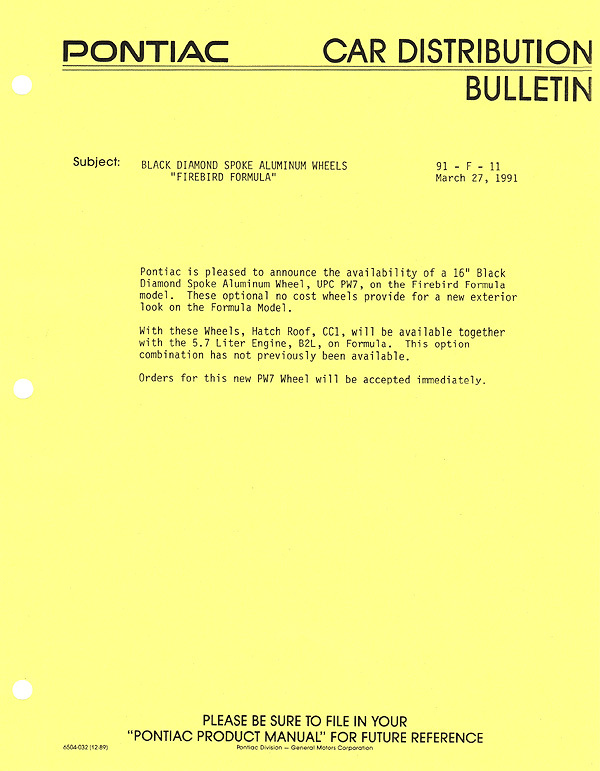 4) CDB 91-F-11 denotes the availability of Formula models with the black PW7 rims, making possible a build combination of B2L engine and CC1 hatch roof together. 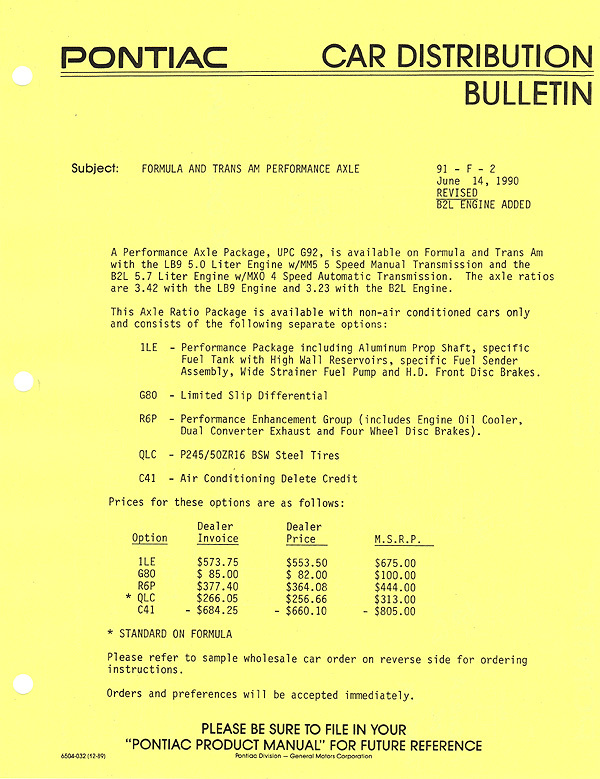 5) CDB 91-F-12 denotes the return of the J65 four-wheel-disc brake installations on 5.0-liter/MM5 and 5.7-liter TPI F-cars. 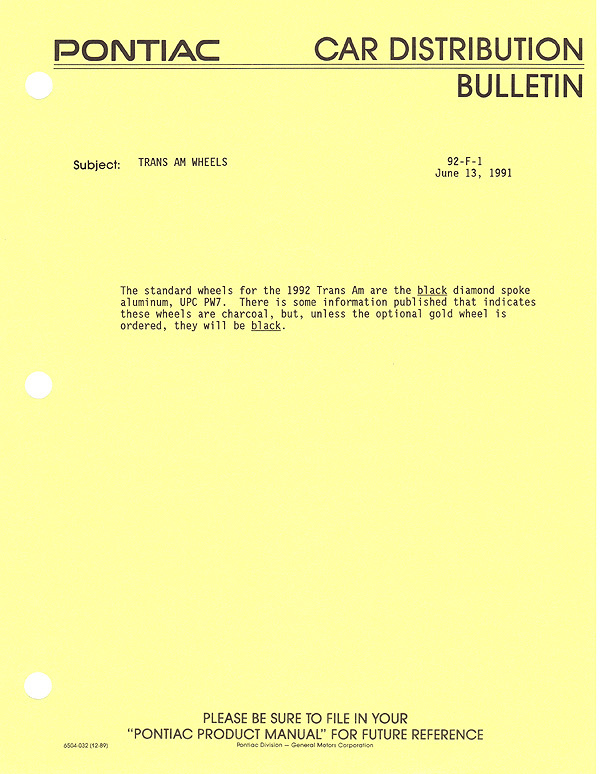 1) CDB 92-F-1 denotes the use of the black PW7 rim as the standard rim for the Trans Am. 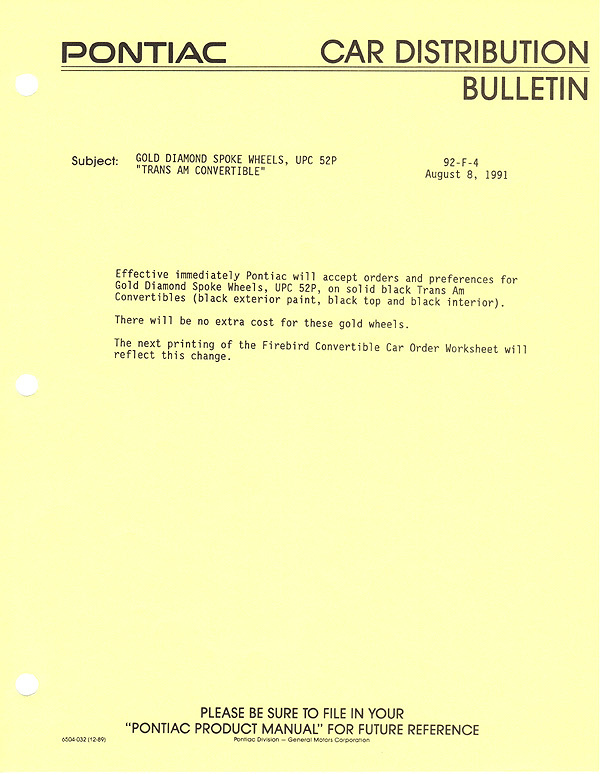 2) CDB 92-F-4 denotes the release of the 52P gold diamond-spoke rim for solid black (interior, exterior, top color) Trans Am convertibles. 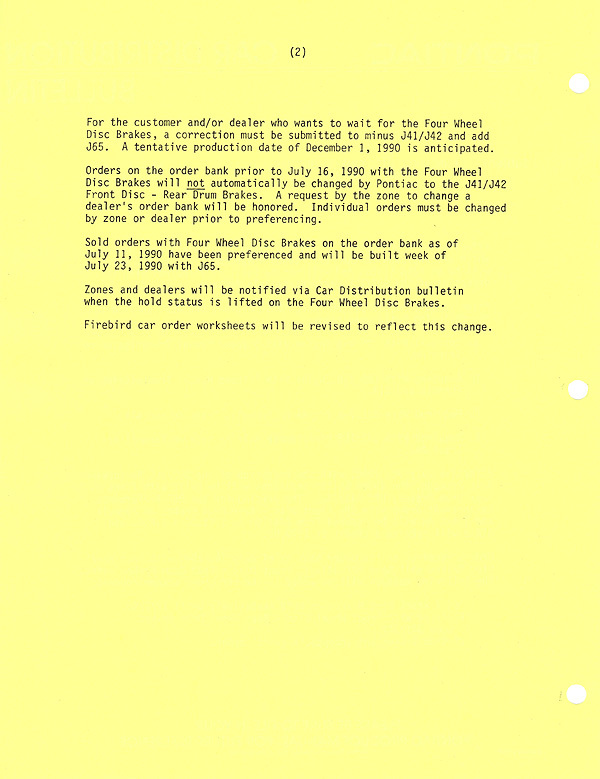 An interesting side note here.... over the years I have always heard from differing sources that the GTA was not built for dealer stock in 1992, but only for customer order. 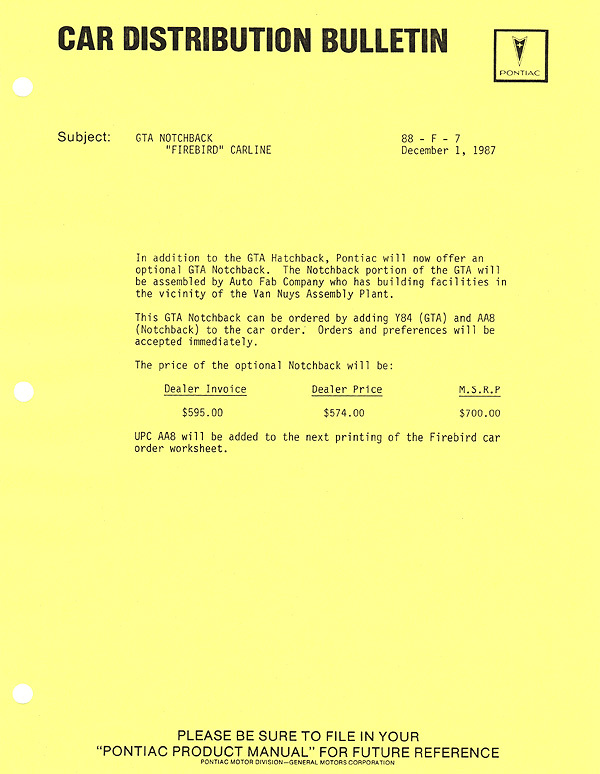 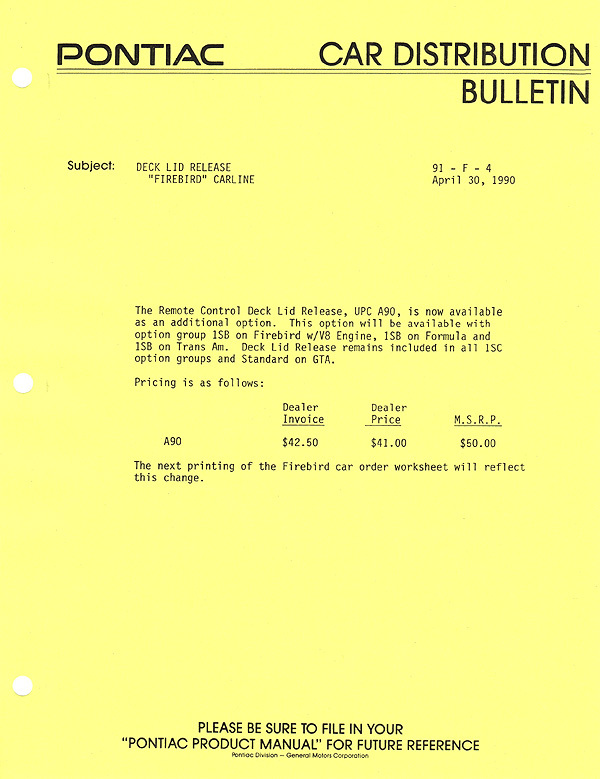 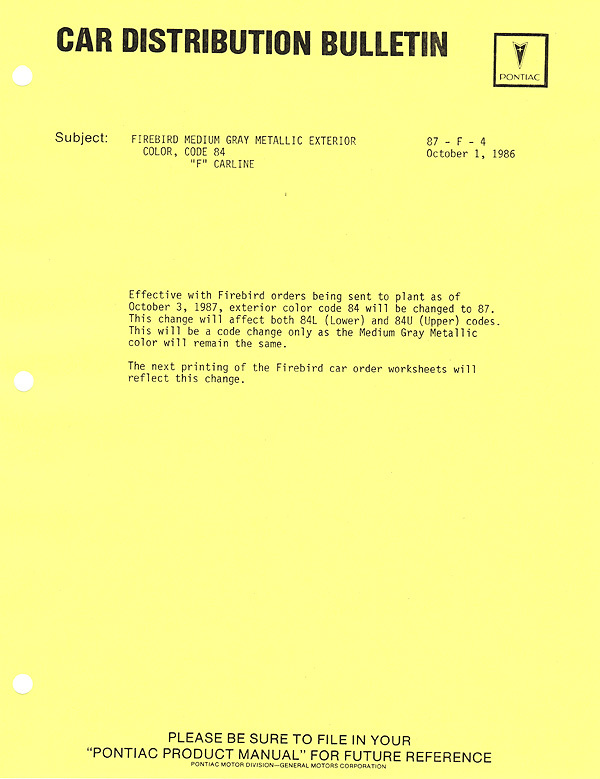 However it appears that this was not the case, as there is no CDB to dealers restricting the ordering of any F-car for 1992.